The COMPOSITE SURVEY I covers the 08-16 UT time range (1pixel/60sec) and zooms are 1 hour long (1pixel/10sec). Frequency range 600 MHz-20 kHz. Logarithmic scale. Note : When DAM is unavailable, Artemis is used also for the frequency range from 20 MHz to 70 MHz or Humain since 1st july 2016. 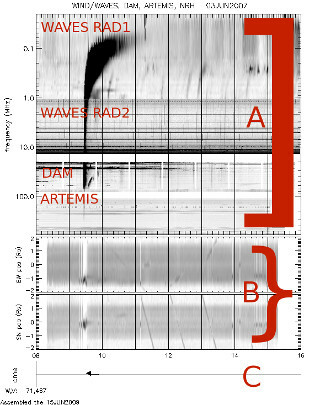 The CMEs are reported in the composite1 survey from 08 to 16 UT.